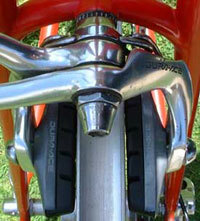 Click here to learn more bicycle brake adjustments. Please note: These instructions are for conventional brakes, not disc brakes. Also, because brakes are so important for safety, do not work on them unless you’re confident in your ability to do the job right. 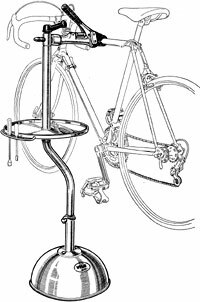 And, keep in mind that in order for brakes to work properly and to make the adjustments explained in this article, the wheels must be true and round (no side-to-side wobbles, up-and-down hops or bends). For optimum braking, the rims and brake pads must be clean. As you use your brakes, however, the pads strike the rims picking up anything on them and sometimes transferring rubber deposits to the rims. The pads even pick up bits of sand and gravel that then grind the sides of the rims as you brake wearing them prematurely. This is another reason it’s important to keep the pads and rims clean (rim replacement is expensive). Keep in mind that pads usually fit a certain way (photo). Look for markings or compare the new one to the old one to make sure it’s oriented correctly (it’s always best to replace one pad a time so you can compare the new one with the one still in place). Pads might be tight, too. If you can’t push it out, try slipping a small screwdriver between the pad and its holder and prying to get it out. You should be able to push the new pad in with your fingers. If it’s a tight fit, make sure you’re putting it in the right way. You can also breathe on the pad to wet it slightly, which will make it slide in easier. Or, wet it with some of the rubbing alcohol. This won’t harm the pad and it will evaporate quickly. One glitch that affects some brakes and can drive you bonkers (and guarantee that you never see any wildlife) is squeaking. To prevent this, there’s a brake pad adjustment called “toe-in.” It involves slightly angling the leading edges of the pads in to touch the rim first. As pads wear, the toe-in wears away so you probably won’t notice this looking at your old pads. With cartridge pads, the toe-in will be there once you replace the pad. With bolt-on types, however, you’ll lose the setting when you install the new pad. So, you’ll have to set it during alignment.